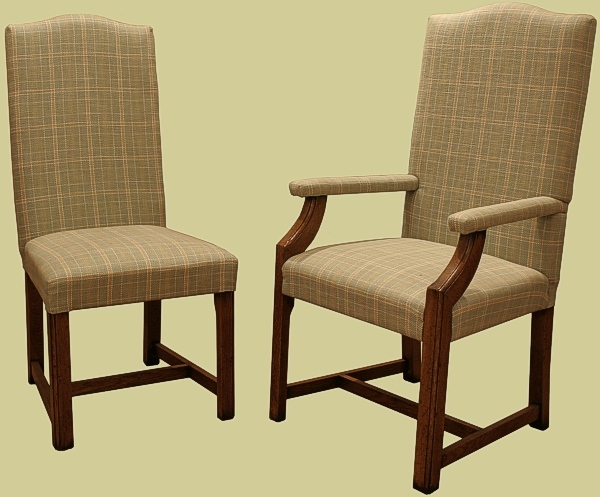 Superb value fully upholstered solid oak side chairs and armchairs available and priced as separate items. Please see drop down box below. Price includes upholstery, but not cost of top material. This can be fitted free of charge, if supplied by client at time of manufacture. We have a good selection of suitable fabric samples at our showroom. We currently have two upholstered side chairs and two upholstered carvers available now, for immediate delivery, from our showroom stock, in 'Raw Sienna' colour and medium ageing (please contact us regarding availability, payment etc. on our immediate delivery furniture). Lead times on our Berwick furniture is often much quicker than full bespoke. ...and for a rather effective way of combining solid seat armchairs with fully upholstered side chairs, see Clever mix of period style oak dining chairs in Sussex home.